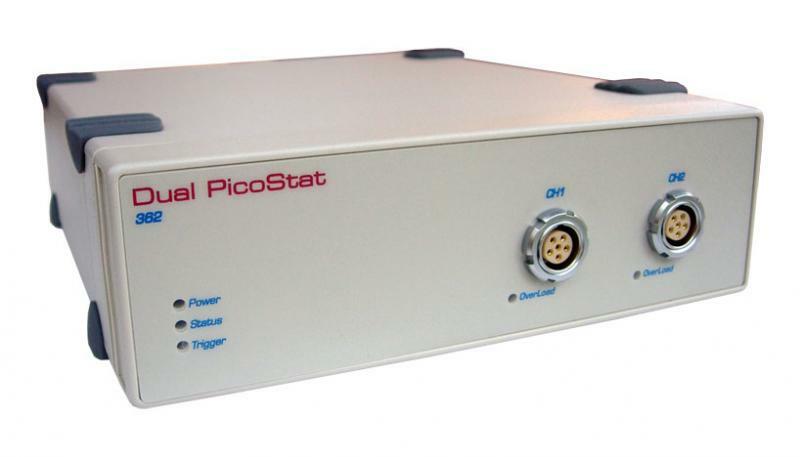 The Dual PicoStat is a two channel high sensitivity potentiostat suitable for use with carbon fiber and ultramicroelectrodes for the monitoring of low current signals (down to picoameperes). It is commonly used for in vivo monitoring of dopamine by amperometry. There are two potentiostat channels which enable the unit to also be used as a bipotentiostat (two working electrodes with a common reference and auxiliary electrode) so that dopamine levels can be monitored at two separate locations. Alternatively it can be used to perform duplicate experiments with separate samples, each with a working, reference and auxiliary electrode. It can also be used as a 4-electrode voltage clamp (with two current passing and two voltage sensing reference electrodes) for studies of ionic transport across membranes or immiscible interfaces. The Dual PicoStat is electrically isolated and is resistant to interference from neural stimulators, and ground loops. It is DC powered and can be used inside Faraday cages if required. The Dual PicoStat must be used in conjunction with an e-corder unit. The e-corder 410 is recommended. NOTE: This unit has recently superseded the EA162 PicoStat some citations of which are reported in the Applications tab. Nanoelectrodes for determination of reactive oxygen and nitrogen species inside murine macrophages. Yixian Wang, Jean-Marc Noël, Jeyavel Velmurugan, Wojciech Nogala, Michael V. Mirkin, Cong Lu, Manon Guille Collignon, Frédéric Lemaître, and Christian Amatore. PNAS, 109, 115434-11539, 2012. Indium Tin Oxide devices for amperometric detection of vesicular release by single cells. Anne Meunier, Rémy Fulcrand, François Darchen, Manon Guille Collignon, Frédéric Lemaître, Christian Amatore. Biophysical Chemistry, 162, 14–21, 2012. Dopamine dynamics associated with, and resulting from, schedule-induced alcohol self-administration: analyses in dopamine transporter knockout mice. Guy Mittleman, Stanford B. Call, Jody L. Cockroft, Dan Goldowitz, Douglas B. Matthews, and Charles D. Blaha. Alcohol, 45, 325-339, 2011. Genotype-dependent effects of adolescent nicotine exposure on dopamine functional dynamics in the nucleus accumbens shell in male and female mice: a potential mechanism underlying the gateway effect of nicotine. Price E. Dickson, Tiffany D. Rogers, Deranda B. Lester, Mellessa M. Miller, Shannon G. Matta, Elissa J. Chesler, Dan Goldowitz, Charles D. Blaha and Guy Mittleman. Psychopharmacology, 215, 631-642, 2011. Bandwidth: 16kHz at100nA and above; 1.6kHz at 10nA and below.